The ancient pilgrim path of Cosán na Naomh takes an 18km (11 mile) route from Ventry Strand to the foot of Brandon Mountain in Co. Kerry. The area is rich in bird and plant life, and heritage sites along the route include the famous Gallarus Oratory, a corbelled structure that may have been built to shelter passing pilgrims. The dry stone oratory, described by Nobel Laureate Seamus Heaney as ‘a core of old dark walled up with stone a yard thick’, has remained watertight since its construction at some time between the seventh and twelfth centuries. A little further along the route, there is an Ogham stone beside the Romanesque church at Kilmalkedar. The church is dedicated to the local St Maolcéadair and is surrounded by fascinating historical remnants, including a twelfth-century sundial. A nearby holy well is dedicated to St Brendan, as is a collapsed oratory of the Gallarus type. Lying against a wall on the far side of the main road is a bullaun, a stone with man-made cavities, which was probably designed for use in blessings and healings. 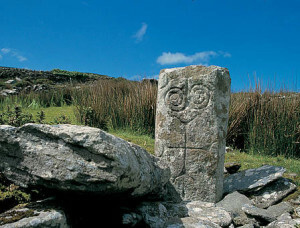 Although the traditional pilgrimage extended to the summit of Brandon Mountain, the route now ends at Ballybrack. The mountain is hazardous, has steep cliffs, and is prone to sudden disorientating mists. Walkers proceed to the summit entirely at their own risk.